Home Tags Posts tagged with "sausages"
In Hungary, raising geese is a centuries-old tradition, its secrets handed down from generation to generation. A whole bird is used to prepare all kinds of dishes: roasts, soups, and even fat that will be spread on bread. Similarly, I wanted to explore a variety of ways to prepare all the parts of a goose, thus providing an exciting alternative to a whole roast, where, invariably, the breast is overcooked or the legs are underdone. I’ll let you decide how you want to piece all these recipes together; you could try serving all the elements over some flageolet beans. 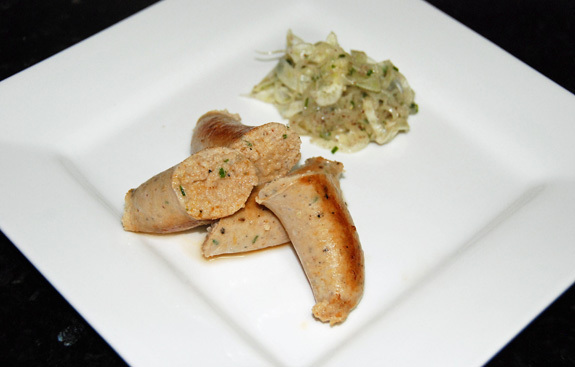 For the sausage recipes below, you can find specialty ingredients (casings, curing salt) and hardware here. Remember to always work fast to make sure the meat remains cold throughout the preparation, returning the mixture to the freezer for a few minutes if necessary. Separate the wings, legs and breast from the carcass. Reserve the legs with their skin for the goose confit. Reserve enough skinned breast meat for the goose “saucisson à l’ail”. Pick the meat from the carcass and bone the wings. Reserve enough skinned carcass, wing and breast meat for the goose liver sausage. Reserve the goose liver for this purpose as well. Render all the unused skin and fat to make goose fat. Use all the bones, neck and remaining offals to make goose stock. Serve any remaining goose breast pan-seared, skin-on. Weight the legs, then weigh 3% of that weight in salt. Cover the legs with the salt mixed with the curing salt. Place the salted goose legs, goose fat, garlic, thyme, bay leaves, peppercorns, cloves and juniper berries into sous-vide pouches. Cook in a 166 F water bath for 20 hours. Before serving, remove the legs from the pouches, and sear in a hot pan, skin side down, until crispy. Place the goose breast and pork fat back in the freezer for 15 minutes. Place the garlic cloves in a small saucepan, cover with the goose fat, and cook over low heat for 30 minutes. Let cool. Mix all the meats, drained garlic cloves, breadcrumbs, salt, curing salt, pepper, onion powder and fennel pollen. Grind the mixture through the large die. Stuff the forcemeat into the casings and twist into 7″ links. 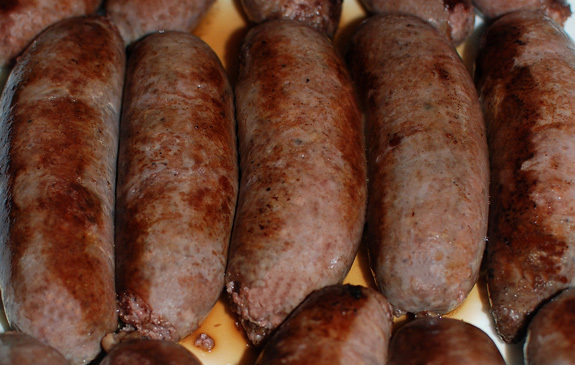 Cover with parchment paper, and refrigerate for 24 to 72 hours, turning the sausages every 12 hours. Prick the sausages with a fork, and cook in a 171 F water bath for 30 minutes. 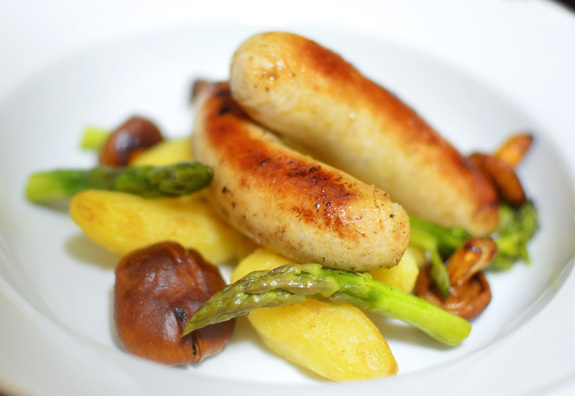 Before serving, cut the sausages into 1″ chunks and cook in a pan over medium heat until brown on all sides. Place the goose meat, pork fat back and liver in the freezer for 15 minutes. Sauté the onion in the goose fat until golden brown, and let cool. Mix all the meats with the onion, salt, curing salt, garam masala, porcini flour and thyme. Grind the mixture through the small die. Transfer to the bowl of an electric mixer fit with the paddle attachment, add the red wine, and whip on medium speed for 1 minute. 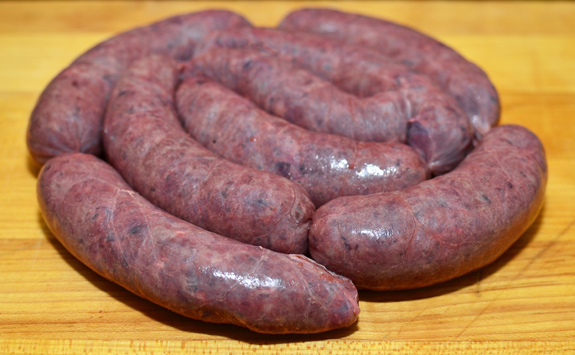 Stuff the forcemeat into the casings and twist into 4″ links. 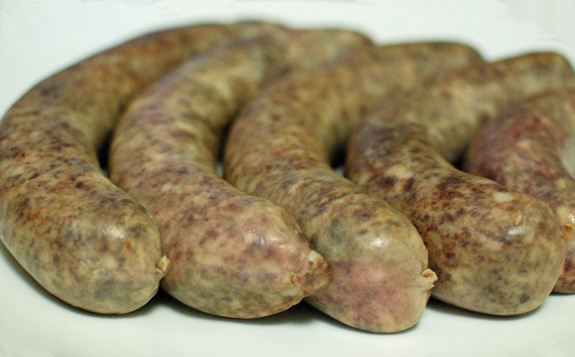 Cover with parchment paper, and refrigerate for 24 to 72 hours, turning the sausages every 12 hours. Prick the sausages with a fork, and cook in a 171 F water bath for 10 minutes. Before serving, finish the sausages in a pan over medium heat until brown on all sides.